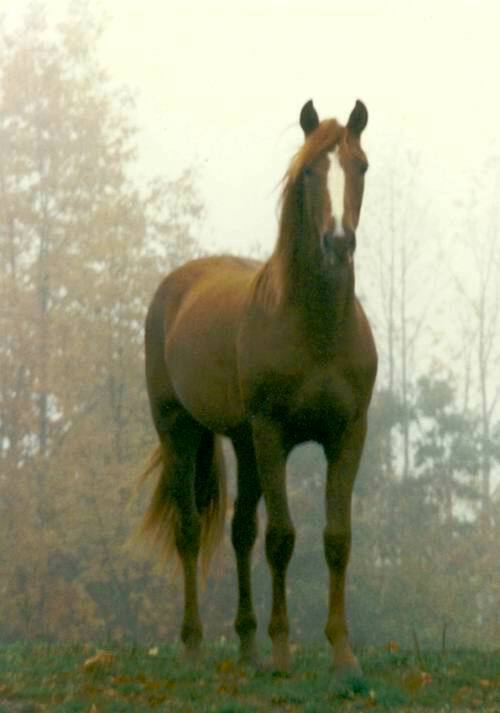 This was our Morgan mare, Meggie, at 20 months of age, standing in the pasture with a Nova Scotian mist surrounding her. I always thought that the picture was very well done by the photographer as her registered name is Maritime Misty Megan. She was/is so lovely . . . with her gorgeous chestnut coat and kind, twinkling eyes. I don't think there is a mean bone in her body. Her breeder told us stories of how she would romp and play with the other horses . . . . games that looked like 'hide and seek' . . . . and how she would wear out her pasture companions to the point that they would go back and stand at the barn door wanting to go inside for a rest. Meggie would come and peek around the corner of the barn at them and then wheel away to play on her own. Her energy was limitless. When we purchased her, Meggie had a stud foal at her side, sired by Fiddler's Black River, and so we allowed them to keep her there until the foal was weaned so he would not lose his momma too soon. Meggie herself was sired by Candy's Shadow, who was one of the many sons of this well-known Nova Scotian Morgan stallion, Jackson Mandate, who you also see pictured here. Jackson Mandate was the senior stud at Hobby Horse Farm in Coldbrook, NS for many years. More on the horses later. Duties are calling . . . . . Your mare is beautiful. 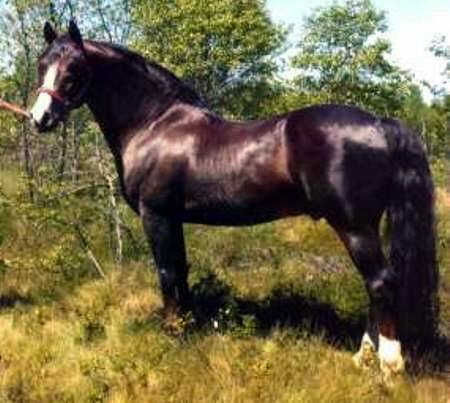 Morgans are my favorite breed of horse, and I hope to someday be able to have one of my own. Thanks Spinner Gal! As well as being beautiful, Meggie was also one of the most athletic horses I've ever seen. I wish you well in your future search for your special Morgan. What a beautiful mare--she looks like she is straight out of a fairytale story book, standing in that mist. Maggie does look like something right out of the Mists of Avalon. Very special! Thanks Cyndy & Leslie! Meggie is special ....... to us. She was also extremely well liked by one of Heather's coachs, Fred Rasmussen. Fred was a retired RCMP officer who had taught the Muscial Ride for years and was involved in setting up the breeding program for the RCMP's own horsefarm. He was very encouraging to Heather, and he was always the first one out to meet Heather and Meggie as they finished a crosscountry run during an event.